In 2002, the Israeli Government adopted a plan to construct a system of walls and fences in the Occupied Palestinian Territory. 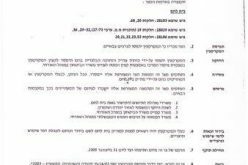 Immediately after adopting the plan, the Israeli civil administration started issuing military orders under various pretexts for seizing Palestinian lands needed for constructing the wall. 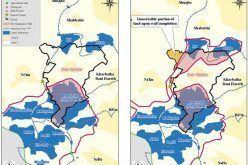 So far, more than 200 Israeli military orders were issued in all West Bank Governorates stating the confiscation of Palestinian lands for constructing the Segregation Wall and resulted in massive damage to the livelihood of Palestinians and dramatically impaired the infrastructure of Palestinian villages and towns. A study conducted by the GIS unit at the Applied Research Institute – Jerusalem showed that the total length of the Wall, according to the latest revised Wall map published on the IDF website on February 2005 and to the military orders that were issued, is 683 kilometers; where only 183 kilometers Wall out of the total length run on the 1949 Armistice Line (Green Line). As of the end of year 2005, 244 kilometers (36% of the total length) of the Segregation Wall has penetrated the lands of the West Bank Governorates and is already obstructing (directly or indirectly) the daily lives of thousands Palestinians living inside and outside the segregated areas (West and east of the Segregation Wall). A total of 116 kilometers is under construction (17% of the total wall length), while 323 kilometers (47% of the wall length are planned to be constructed. Once completed, the Wall will segregate 576 km² of the Palestinian land in the western segregation zone (approximately 10% of the total West Bank area – 5661 km²). It will also enclose 98 Israeli settlements which accommodate about 83% of the total Israeli settlers' population in the West Bank, in addition to 55 Palestinian communities. Additionally another 1664 Km² (29.4% of the West Bank Area) will be segregated in the eastern segregation zone where the segregation is maintained by blocking access on all roads that lead to the Jordan valley and western shores of the Dead Sea. 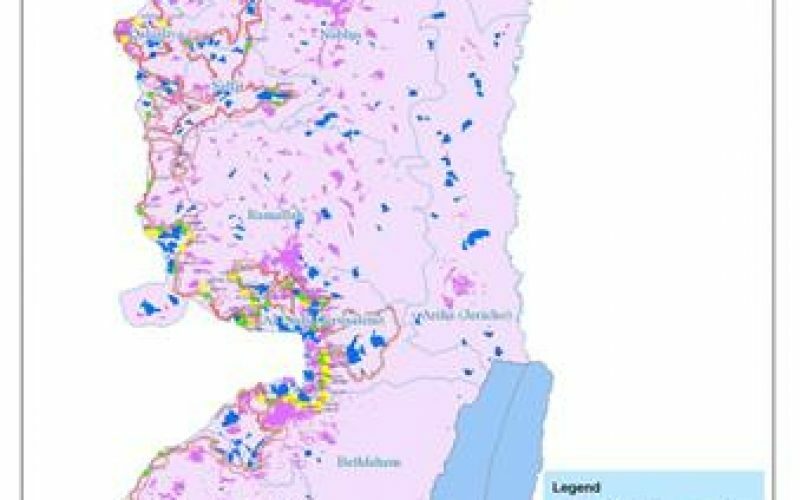 The eastern segregation zone encloses 43 illegal Israeli settlements and 42 Palestinian communities. 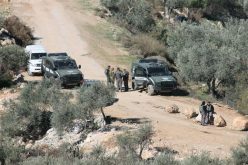 In September 2004, the Israeli Occupation Forces issued military orders to create a buffer zone averaging from 150 to 200 meters on the Palestinian side of the Segregation Zone where new constructions are prohibited. As a result, an additional 252 km² of the West Bank (4.4 %) will become inaccessible to Palestinians. A wave of petitions were filed to the Israeli high court by Palestinian residents and Village councils in West Bank Governorates rejecting the route of the segregation Wall and demanding Israel to abolish it or if it insists to build it, to position it on the Green Line or westwards. Palestinians were also objecting the desperate living conditions and property damages the existing Wall sections had caused them and the tremendous losses it will cause once fully constructed. In addition, the Wall has been subjected to several changes during its course of construction, table 1 below details the changes that have been made to the route of the Segregation Wall since its inception in June 2002. Cases were handled by the Israeli High Court – No Further discussion. Jubara, the hamlet of 317 residents (PCBS 2005), located to the south of Tulkarm, is one of the villages that brought its case to the Israeli court due to its location isolated between the 1949 Armistice Line (Green Line) and the Segregation Wall. Works on the Wall in Kherbit Jubara were completed by October 2003 and a visible Wall line of 5.8 km runs along the eastern lands of the village and caused the loss of 590 dunums of its agricultural lands. The current standing of the wall caused to cut off a major Palestinian road (road number 574), which is considered an artery road ((runs roughly from north to south) for many small Palestinian communities who seek various services in Tulkarem city. This road cuts the village from the middle and connects with bypass Road 557 ( a complete prohiobted road where Palestinian vehicles are prevented from using it), south of Tulkarm city. Furthermore, following the eruption of the second Intifada in September 2000, the Israeli forces erected a new checkpoint on Kherbit Jubara's entrance (from the north) and restricted the movement of Palestinians going into and out of the village. On December 2004, villagers of Jubara received a new military order number 90/04/T stating a new Wall route to be constructed along the village's eastern part. According to the military order, the Wall is to be rerouted along the western parts of the village and parallel to the 1949 Armistice line. 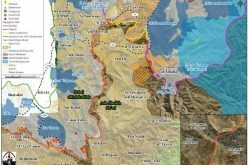 Two months later, on February 20, 2005, the Israeli ministry of defense issued an updated Wall map which showed a new Wall route to be implemented in the West Bank. The Second group of petitions was given the color green on the map and represents the petitions filed by Palestinian residents and village councils to the Israeli High court and were handled by the court; meaning that, no longer will the court open the petitions for further discussions. It should be noted here that the petitions are not necessarily handled in favor of Palestinian citizens despite the negative effects the Wall has on people's lives. The petitions raised to the Israeli court against Wall constructions in this category were at: Rachel's Tomb area, Kherbit Mazmuria (An Nu'man village), Ar Ram Town, As Sawahreh Ash Sharqiyeh, villages located to the northwest of Ramallah city, and a number of villages in Qalqiliya and Tulkarm Governorates. Table 4 below details the petitions along with the date of the petition, and village or party involved. Some Palestinian villages and cities in the middle and southern Governorate are nowadays witnessing wall constructions. The following are some examples of the ongoing Wall construction at Bethlehem Northern Entrance, Mazmuria, Al Walajeh, Ar Ram Town and Al Barid Outskirt with references to previously written case studies by ARIJ Field researchers. It is worth mentioning that the Israeli bulldozers were working on the site months earlier to the issuance of the military orders. The orders are complementary to the Israeli Segregation Wall plan which is being implemented on lands of the two villages and confiscate 722 dunums (0.722 km²) of Beit Sahour's village boundary in addition to the area that has already been confiscated following the 1967 war for rewarding the Jerusalem Municipal Boundaries. Today, an arbitrary wall line of 3.44 km long is clearly seen as one enters the village of An Nu’man and it was constructed on the expense of hundreds of Olive trees that were cultivated on the lands that witnessed constructions. The Wall is in its final stages and is eating up much of the village’s lands with its wide structure. The Segregation Wall around Rachel's Tomb is in its final Stages and extends from Gilo 300 terminal to enclave Rachel's Tomb area at the northern entrance of Bethlehem city. It stretches a length of 1.3 kilometers, comprising about 3% of the total Wall length in Bethlehem Governorate (52 km). 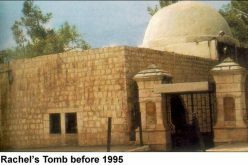 The area around Rachel's Tomb has been witnessing Wall constructions since the beginning of year 2005. During that time and till the date of this article, the IOF accelerated their efforts in installing huge concrete Wall blocks (8 to 12 meters high) in the area, increasing the pace of destruction and resulting in the isolation of vast areas of agricultural lands and Olive trees. Today, Bethlehem northern entrance is sealed off from Jerusalem. A Huge Wall gate is situated at the main road leading to the city of Bethlehem and Rachel's Tomb area and is monitored by an Israeli military tower situated several meters away to the west of the gate. This Gate, according to some official Israeli sources, will be opened few times a year, mainly on religious holidays, Christmas and Easter. On November 15, 2005 Israel inaugurated terminal '300' in the northern entrance of Bethlehem Governorate; the first terminal out of 15 other terminals being constructed along the Segregation Wall in the West Bank. A separate road was also constructed along the Segregation Wall path for the Jewish people coming from Jerusalem and heading towards Rachel's Tomb. This road was constructed so as not to make Jews wait in queues to enter through Gilo '300' terminal but rather drive into the road already constructed alongside the Segregation Wall which reaches a gate constructed north of the Tomb area and guarded by Israeli soldiers that is solely used by Jewish buses/cars and military forces. On February 19, 2006, the Israeli Occupation Forces issued a new military order number ((25/06/T (Page 1, Page 2 & Page 3)) to confiscate 39.8 dunums of lands in Al Walajeh Village for the construction of a new Border passages in the area. The Border passage was given the name 'Har Gilo Border passage' and will limit the access of Palestinians into and out of the village. Work on constructing the border passage started a time earlier of the Israeli military announcement to construct the passage. Israeli bulldozers were and are still working till this day on the site. The military order is a complementary to the Israeli Segregation Wall plan which is being implemented on lands of the village. On March 2005, the Israeli occupation forces (IOF) served out residents of Dahiet Al Barid military order number (05/57/T Judea & Samaria 2005, Page 1, Page 2 & Page 3) stating the seizure of 26.2 dunums of lands to construct a new Wall section in the area. The Israeli plan intends to isolate an active part of Dahiet Al Barid from the rest of its community, Ar Ram town. The area that is going to become segregated by the Wall includes a number of educational institutions and international organizations. On June 22, 2005, the Israeli High Court of Justice issued a temporary restraining order to stop constructions of the Segregation Wall planned in the southern part of Ar Ram Town (Dahiet Al Barid neighborhood) until discussions over petitions are heard. Few months later, on October 16, 2005, the Israeli court has approved the resumption of Wall constructions in the area, putting an end to the restraining order it issued in June 2005 for ' urgent security need' as quoted by the Israeli court. Beit Sira is a Palestinian village located 22 Km southwest of Ramallah district and houses a total population of 2744 residents – PCBS population projection 2005. On December 14, 2003, the Israeli Army issued military order # (03/104/T) to seize 149 Dunums of Beit Sira village lands for erecting the segregation Wall. The order was just a segment of the segregation Wall in that area which penetrates Beit Sira's lands. However, the order was yet to include a supplementary order to split the village literally into two parts. As residents of Beit Sira elevated the level of protest against the Israeli segregation Wall, the latter, temporarily stopped the (03/104/T) seizure order to re-evaluate the route of the segregation Wall in the area. Later on June 24, 2004, the Israeli Army issued another military order # (03/105/T) categorized as (Border Amendment) where a shift in the route of the segregation Wall was apparent westward of Beit Sira built-up area. The segregation Wall's new route sets along the marked-line of the 'No Man's land' area and the Latrun road. Furthermore, the route of the segregation Wall in military order # (03/105/T) will consume 222 Dunums of Beit Sira's agricultural lands in addition to the isolation of 1945 Dunums that will be segregated behind the wall. 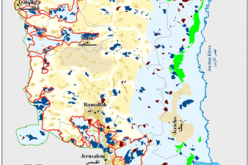 On February 20, 2005, the Israeli Ministry of Defense published an updated wall plan which suggested some changes in the wall route in West Bank cities and villages. Beit Sira was one of the villages that witnessed a change in wall route but it wasn't at favor of the Palestinian residents in the village since the wall will run a length of 2.5 km along the village's lands, from north to south, and will cause the segregation of 2973 dunums west of it, an area which is quite larger than that of June 2004. Already 0.5 km wall are under construction in Beit Sira village while the other 2 are planned to be constructed. 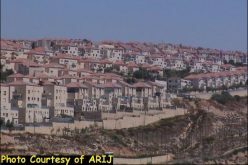 In the year 2003, the Israeli authorities and under security claims decided to construct a Segregation Wall around Ariel settlement bloc in Salfit Governorate (a bloc of 26 Israeli settlements). Since then, the Israeli bulldozers razed vast areas of lands and uprooted many fruitful trees. The Israeli Supreme court halted the construction of the Wall in the area several times due to petitions raised to the court by Palestinian residents of the nearby villages of Iskaka, Marda and Az Zawiya. 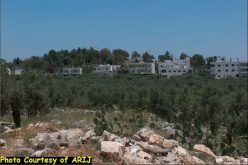 In September 2005, the Israeli deputy defense Ze'ev Boi'm said that the construction of the so called 'Ariel Finger' east of Ariel settlement bloc must be constructed as soon as possible. 'Ariel finger' is the deepest incursion for the Israeli Segregation Wall inside the West Bank, as it goes deep as 22 km. The Wall around Ariel bloc stretches for 114 km and grabs within it 120,000 dunums of lands which is larger than the area the other settlement blocs encompass. The Israeli Segregation Wall has harsh impacts on the Palestinian society, especially that it cuts off the agricultural lands from its owners, and deprives them their living; thus affecting the economic situation. The Wall also restricts the movement of Palestinians and extends to affect all aspects of life. Apartheid is alive: The confinement of ‘Anata and Shu’ufat refugee camp in an enclave. The Segregation Wall seized more lands of Beit Surik Village!!! The Segregation Wall, an unlawful measure of Land Grab !! !